There are numerous options when it comes to selecting choice fabrics for a custom suit. At Customeyes, you can choose from a wide collection of bridges that constitute the center piece of your custom eyeglasses. To explore suitable styles for your features, schedule an appointment now and discover the bespoke experience by Nader Zadi. The Four Seasons Hotels & Resorts is a distinguished brand in luxury hospitality recognized for the highest standards of excellence in service, design, and guest experiences. Their exclusive in-room magazine covers inspiring and fascinating content about style, fine food, exotic travel destinations, and in this issue an emphasis on the art of craftsmanship. An introduction to celebrated artisans and their craft, paying tribute to artisanship, showcasing products made by hand, meticulous hand tailoring, custom design, couture creations made of the best materials by the best of the best – aficionados and artisans passionate about the intricacies of their craft. Amongst the features, includes this article “For Your Eyes Only” in which Nader Zadi is Bespoken for. Nader Zadi is sought after for his unrelenting passion for designing and creating classic and sophisticated eyeglasses and sunglasses which have been described by some as works of art. 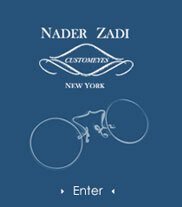 As the founder of Customeyes, an exclusive vintage and bespoke eyewear atelier in New York City, Zadi specializes in custom eyewear. Zadi expertly assesses his clients’ faces to make frames that fit, function and flatter each person’s unique facial characteristics. His meticulous craftsmanship promises a distinguished look for anyone who wears one of his designs. Handcrafting each pair using old-world techniques, Zadi transforms his creations into contemporary and stunning designs for today’s fashion.